Stem cells are the body's "master" cells that regenerate and turn into the cells that form all of the tissues, organs, and systems in the human body. The different cell types within the body are all derived from such cells- and hence the name. Stem cells are undifferentiated, "blank" cells that do not yet have a specific function. Characteristically, stem cells have a high capacity for self-renewal. Stem cells have the unique ability to differentiate into a variety of cells. When a stem cell divides, each new cell has the potential to either remain a stem cell or become another type of cell with a more specialized function - such as a muscle cell, a red blood cell or a nerve cell. Given the right environment, stem cells can give rise to a number of tissues that constitute the different organs. Also serving as a kind of repair system for the body, stem cells can divide repeatedly and then differentiate and replenish cells within the body. These unique characteristics are the reason why stem cells are considered a breakthrough in regenerative medicine. They have the potential for providing cells and tissues to treat various debilitating, life-threatening diseases. Stem cells can be derived from various sources such as the bone marrow, embryos obtained by in vitro fertilization, amniotic fluid, umbilical cord blood and menstrual blood. These stem cells have the potential to become any kind of cell in the body. After an egg is fertilized, it undergoes a series of divisions to become an embryo and later a fetus. The cells that are formed during these first few divisions are totipotent i.e. they can become any cell in the body. Human cells have this capacity only during the first few divisions of a fertilized egg. After 3 - 4 divisions of totipotent cells, these cells will not be able to differentiate into any cell type. This type of stem cell has the ability to become almost any kind of cell in the body-except the cells of the placenta or other supporting tissues of the uterus. Pluripotent stem cells result after totipotent stem cells undergo the first few divisions. Embryonic stem cells at the blastocyst stage and fetal stem cells are pluripotent. Totipotent and Pluripotent cells are essential for the development of an entirely new organism, which is why they are found in the early stages of development. These cells can give rise to several other cell types, but those types are limited to mostly cells of the blood, heart, muscle and nerves. These cells function as a repair system for damaged tissue. 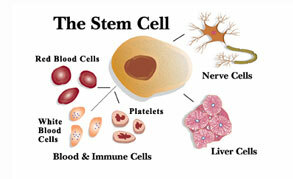 Adult stem cells are a good example of multipotent stem cells. It is a very good explanation of the details that Parkinson's occurs and the effects they cause, we hope to provide some kind of help for people who suffer, because there are many people in the U.S. who suffer and take medications as vicodin to control chronic pain. excellent information on this blog. My son had autologous stem cell transplant for diabetes type1 almost a year ago. I would like to share my blog with you. you may find some useful info.